Jesus died and rose again to do more than just get you to heaven. God has plans for you today . . . plans He prepared in advance for you. 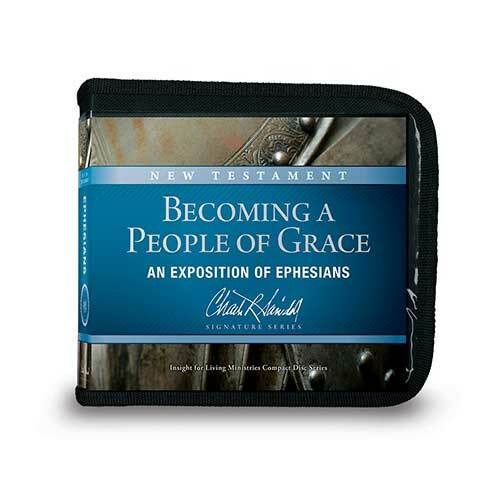 Chuck Swindoll’s practical study of the book of Ephesians reminds us that we were not saved by good works . . . but for them. God’s grace can transform our thinking, our prejudices, our marriages and families, our jobs—and our incessant spiritual and emotional battles. Jesus died and rose for our salvation—yes—and that we might become a people of grace. What Is Christ Doing Now . . . And Why? This Little Light: Is It Really Mine? Copyright © 2000, ℗ 2009 by Charles R. Swindoll, Inc. All rights are reserved worldwide. “Grace” arranged by Mark Hayes using the folk tune “The Water Is Wide” With lyrics from “Amazing Grace” by John Newton Copyright © 1993 by Beckenhorst Press. All rights reserved worldwide. Copyright ℗ 2009 by Stonebriar Community Church. Used by permission. “A Mighty Fortress is Our God,” lyrics by Martin Luther, English translation by Frederick H. Hedge; last stanza setting and choral ending arrangement by Bruce Greer: Copyright © 1997 by Word Music/Integrity’s Hosanna! Music. All rights reserved worldwide. Copyright ℗ 2007 by Stonebriar Community Church. Used by permission. “Amazing Grace,” lyrics by John Newton; last stanza setting and choral ending arrangement by O.D. Hall, Jr.: Copyright © 1997 Word Music and Integrity’s Hosanna! Music. All rights reserved worldwide. Copyright ℗ 2009 by Stonebriar Community Church. Used by permission.